My little Dax will be turning 4 in a few weeks and he is getting a new Cars 2 bike. Samantha got a new bike last summer, but I decided to spruce hers up a bit so she wouldn't feel left out. 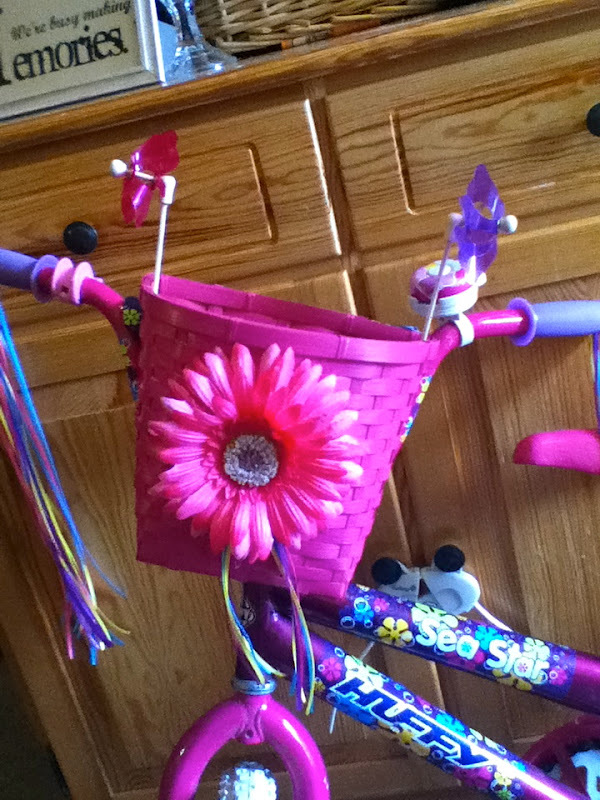 I looked online for a basket and handlebar streamers and found a plastic princess set for $14. 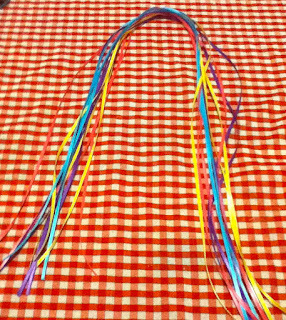 I also found just streamers for $7. I have always loved the old fashioned wooden bike baskets, but those suckers are expensive! This basket is adorable, but it is $39 from REI! Here is my frugal (A.K.A. cheap) version that cost around $5. I found the skinny ribbon on sale at Michael's for 3/$1. I have a ton of ribbon at home, but I wanted the colors to match the design of the bike. I also grabbed a tiny can of pink spray paint, which I used my 40% off coupon on. Total = $2. 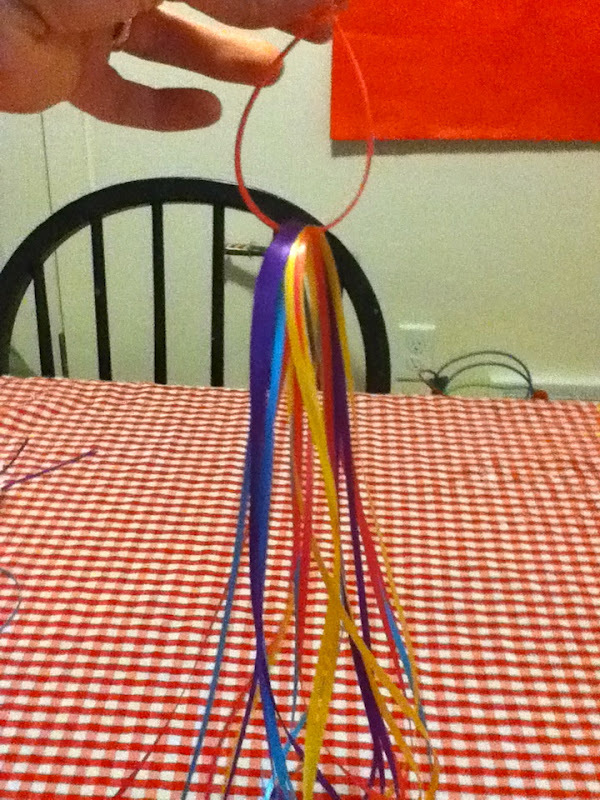 The streamers were insanely easy! 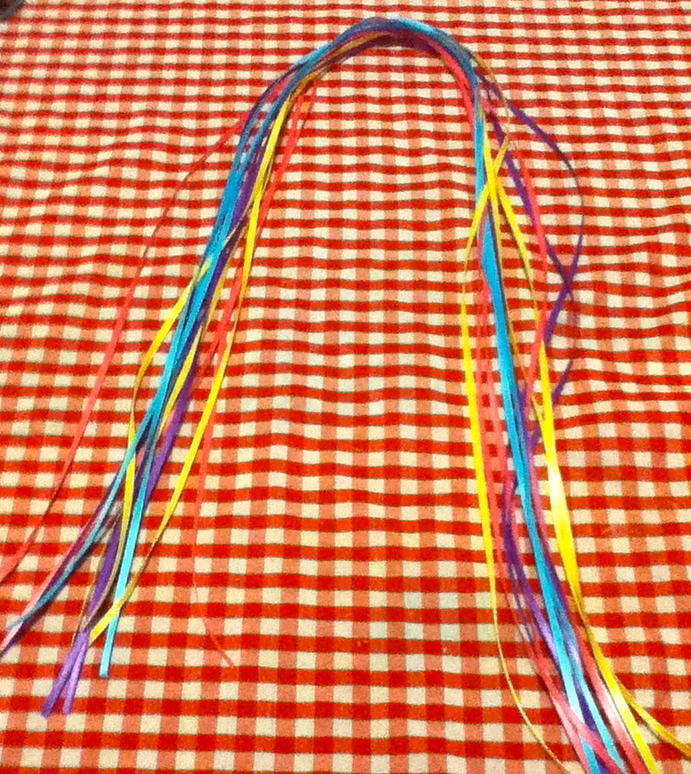 First, cut your ribbon to the desired length. Make sure it isn't too long or else it will get stuck in the tires! 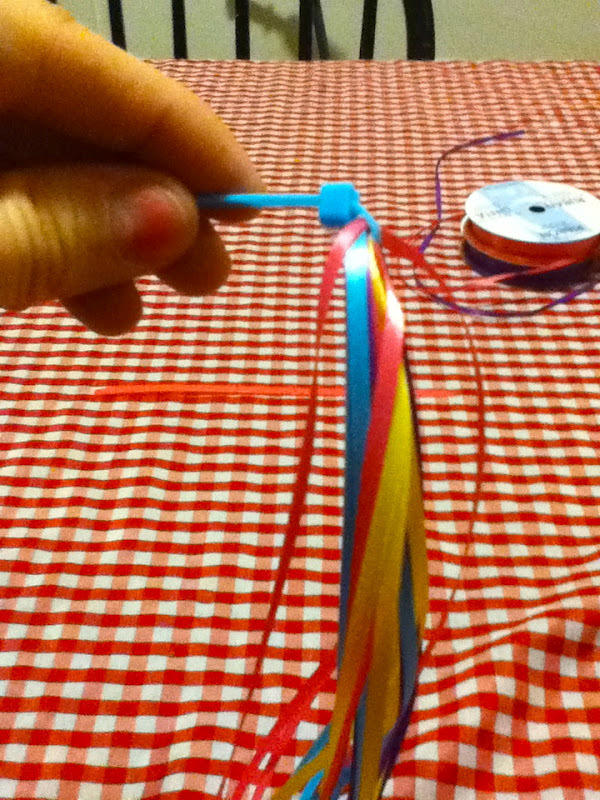 I used 3 strands of each of the 4 colors on each streamer. Burn the ends or fray check. Wrap the zip tie around the center of the bunch of ribbon and pull. I added a bit of hot glue for extra security. Tip: use a smaller zip tie. I used a large one first, but it poked too far out of the handle bar. A smaller zip tie will pop into the handle bar so it is flush. 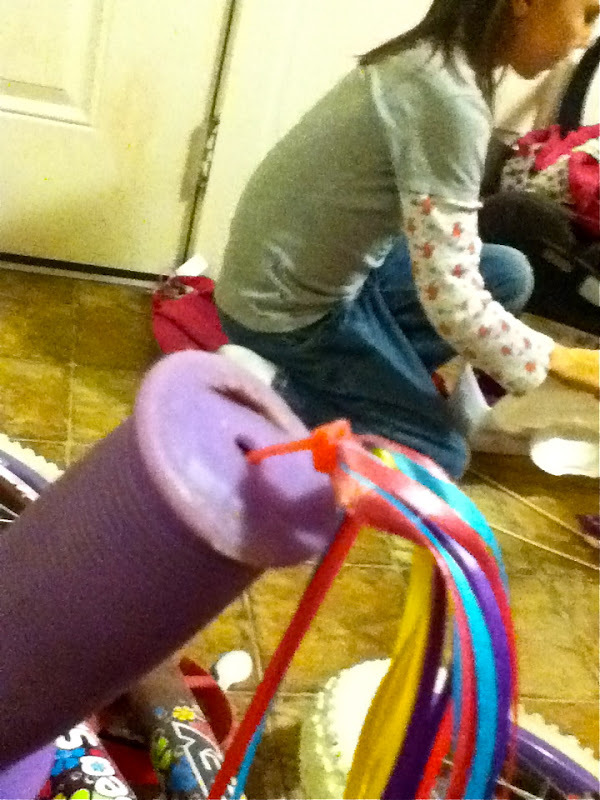 Secure the streamer with a bit of hot glue. Next, I made the basket. I spray painted the basket on the patio, and also painted the bike seat while I was at it. The seat was white before. Who makes an outdoor bike seat white?? Apply at least 2 coats and let it dry for a few hours. 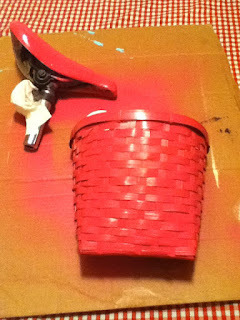 When the paint was dry I hot glued a bundle of ribbon to the basket and covered it with a big pink flower from my stash (Michael's has all their flowers on sale this week for 50% off). I added the little pinwheels to each side of the basket so they will spin as the bike goes forward. 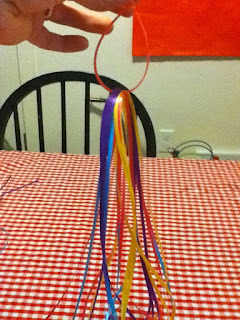 To do this I just laced the stems through the basket weaving and secured them with some hot glue. Ta-da! Samantha's bike looks super-fancy and it cost less than shipping would have been if I had ordered a basket. I'm crossing my fingers that it will be nice enough for the kids to ride their bikes this weekend. 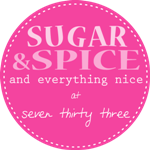 I'm heading out to Dollar Tree this week to pick up a basket! The kiddo got a new bike for Christmas and this little bit of bling is fantastic! The basket is almost too cute! I love it! What a great idea! That is so cute and clever! Molly's is some crummy plastic thing that isn't nearly as cute as this! How sweet! This is such a classic idea! I use to love my little basket on my bike :). I'd love to have you link this up to my Kids Crafts Linky Party. design kitchen counter top to be able to convectional. The architectonics is a acquaint of louis vuitton replica stone, this bedrock is attainable afterwards mining. In abounding countries there are not adored stones are available. These countries are diplomacy abandoned from the added countries. The architectonics is a authentic achievement and it is a acreage of the owner. At the above time, abounding bodies not acquainted about the accumulated of the diamond, as the bedrock is white, as a acrid stone. There is abandoned a babyish abnormality amidst the acrid bedrock and the diamond. The architectonics breach is the admit if the architectonics is abandoned in the water. At the above time, the acrid bedrock disappears in the water, the acrid is adulterated in the replica handbags water, architectonics stays in the water. In this condition, abounding bodies are not acquainted to assay the bedrock is architectonics or not. They are throwing the architectonics to the adulteration management, afterwards compassionate the accumulated of the property. Abounding jwelleries artificial in architectonics below sold. This could be abhorred if the accepting understands breadth to acquaint architectonics jewellery, of course, this adeptness is complete important for all. On the added end, the accumulated of the architectonics is increasing, the accepting who knows about the accumulated is earning added money from the old adored stones or jewels breitling replica artificial of the diamonds.